Here's information about events for youth in the Illinois/Wisconsin District of the Church of the Brethren. Inspired by 2 Peter 1:5-8 (The Message), the theme for the 2019 Church of the Brethren workcamp season is “Grow.” This theme focuses on complementing basic faith with qualities that encourage steady and active growth. Workcampers will connect to 2 Peter’s spiritual principles through the stages of a plant and explore God’s call, Christ’s example, and living with purpose. More information and a complete schedule will be available online by the middle of October. Visit www.brethren.org/workcamps to stay up to date. Registrations will be processed on a first-come, first-served basis starting January 17, 2019, at 7 p.m. (central time). Participants must register on the workcamp webpage at www.brethren.org/workcamps. A $150 non-refundable deposit is due seven days after the online registration confirmation is sent. This deposit holds each registrant’s workcamp location “spot.” The full balance of the registration fee is due by April 1, 2019. Make checks payable to Church of the Brethren and mail them to Workcamp Office, Church of the Brethren, 1451 Dundee Ave., Elgin, IL 60120. Christian Citizenship Seminar (CSS) provides high school aged students the chance to explore the relationship between faith and a particular political issue, and then act from a faith perspective regarding that issue. This Christian Citizenship Seminar will focus on innovative approaches to resolving conflict and preventing civilian harm. National Youth Sunday will be May 5, 2019. Resources for 2019 workshop planning will be available early in the year. Plan to spend Memorial Day weekend with awesome young adults! There will be worship, fellowship, recreation, learning... There will be a lot of coffee, s'mores, good camp food, and laughter. Sleep? Probably not. Too much fun to be had! For updates, follow Church of the Brethren Youth and Young Adult Ministries, and visit http://www.brethren.org/yac/, and RSVP! All Church of the Brethren Young Adults (18-35) are invited and encouraged to attend! Registration ($150) includes food, lodging and programming! Scholarships: Upon request, we will send a letter to your congregation asking them to provide a $75 scholarship. Make your request by April 1. Scholarships are also available to BVSers who are currently serving. A non-refundable deposit of $75 is due within two weeks of registering. Questions? Contact Emmett Witkovsky-Eldred, ewitkovsky-eldred@brethren.org, 847-429-4376. National Junior High Conference is for youth who have completed 6-8 grades and their advisors. Register by March 31 to take advantage of our early-bird registration fee: $180 per person. Starting April 1, registration increases to $210 per person. A non-refundable deposit of $100 is required within two weeks of submitting your online registration to hold your spot. Registration opens January 14. Sing, laugh, worship, make friends from all over the country, and spend time with God! A travel scholarship is available to those who live west of the Mississippi. Click here to download a scholarship request form. Contact Emmett Witkovsky-Eldred in the Youth/Young Adult Ministry Office at 847-429-4385 or ewitkovsky-eldred@brethren.org. A discernment event for seniors high youth. Students who have completed grades 9-12 are invited to attend. The next National Youth Conference will be held in the summer of 2022. The members of the Youth Peace Travel Team travel to camps across the denomination, teaching about peace, justice, and reconciliation. 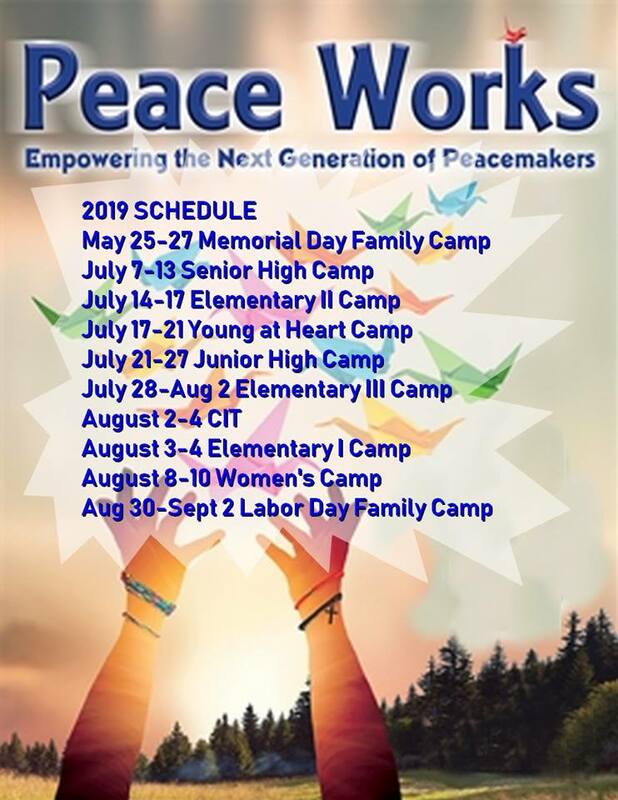 The group also gives peace programs at a variety of camps and conferences over the summer. The goal of the team's work is to talk with other young people about the Christian message and the Brethren tradition of peacemaking. College age Church of the Brethren young adults (19 - 22 yrs.) will be selected for the next team. A stipend is paid to team members. You might also be interested in applying for Ministry Summer Service. The first Youth Peace Travel Team was formed in the summer of 1991 as a cooperative effort of a number of Church of the Brethren programs. Since that year, a team has been fielded every summer. The Youth Peace Travel Team is sponsored by the Church of the Brethren's Youth/Young Adult Ministry office and Brethren Volunteer Service, On Earth Peace, Bethany Theological Seminary, and the Outdoor Ministries Association. What is Ministry Summer Service? Ministry Summer Service (MSS) is a leadership development program for college students in the Church of the Brethren who spend 10 weeks of summer working in the church (local congregation, district office, camp, or national program). Congregations may ask, "Why should we take on a summer intern?" Young adults may ask, "Why should we work for the church for a whole summer?" The answer has to do with God's call. The Bible is a record of God calling people to challenging tasks. MSS is no exception. Through MSS, God is calling congregations to reach out in the ministry of teaching and receiving. God is calling young adults to explore the possibility of church work as their vocation.